Viruses are so small that you can fit more than three trillion on the surface of a penny. Viruses are everywhere–scientists have counted over one billion in a teaspoon of seawater or natural water, or at least 10 million per drop of seawater (Parsons R et al, Ocean time-series reveals recurring seasonal patterns of virioplankton dynamics in the northwestern Sargasso Sea, The ISME Journal, August, 2011). The good news is that relatively few viruses are harmful to humans. Still, those harmful viruses are hard to fight because of their size and because they keep changing. But they are not harmful until they get past the cell wall and are inside a living cell where they can replicate. Several groups of viruses cause influenza and around 200 viruses cause the common cold. Early laboratory cell studies have shown that EGCG, the primary antioxidant polyphenol from green tea and theaflavin, the primary antioxidant polyphenol from black tea prevent both influenza A and B viruses from adhering to cell walls, the first step to infection (Nakayama, 1993). People were given a black tea gargle twice daily for five winter months. When tested for two influenza A viruses and ten influenza B viruses, the black tea gargle group showed a significant 25% reduction compared to controls (Iwata, 1997). A study using a green tea gargle showed 87% protection from flu. A study with green tea catechins found that EGCG was the most powerful inhibitor of the common cold adenovirus. EGCG worked in late stage virus infection by inhibiting protease (Weber, 2003). Green tea also inhibits protease in HIV infections. A study with mice applied influenza viruses to their nose. The control group became infected and all died within 10 days. The tea group had black tea mixed with the viruses applied to the nose. All mice receiving tea survived. One amazing result is that 90% of the mice receiving tea did not even form antibodies to the viruses. They were exposed to the virus, but not only did they survive, but for their immune system, it was as if the exposure had never happened. The black tea used was at “cup of tea” strength (Nakayama, Inhibition of the infectivity of influenza virus by black tea extract, Kansenshogaku Zasshi, July 1994). Cold and flu viruses are spread through the air and by touch. Keep reasonable barriers and wash your hands frequently. Consider a flu vaccination if appropriate. 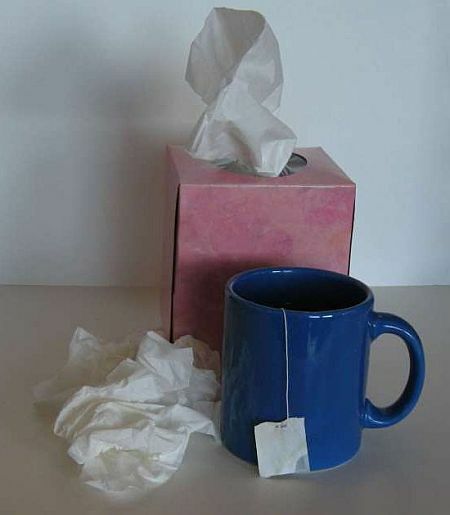 Another way to help defend yourself against cold flu viruses is to protect your immune system. Keep your immune system strong by eating healthy food rich in vitamins, minerals, and other nutrients, getting sufficient rest, exercising daily, stopping smoking, and managing stress. And explore all the health benefits of green tea.